Onion is a vegetable and herb that resides in the same botanical family with chives and garlic. The sharp bite and lingering aftertaste of raw onion is due to the oxygenation of the same enzymes that cause watering eyes when cutting into the fresh bulb. Dried onion, whether granulated or powdered, has a milder taste, is much easier on tear ducts and has the added benefit of possessing a long shelf life. Dried and chopped or granulated onion is added directly to foods while cooking and to savory breads and rolls prior to baking. Powdered onion is used as seasoning to enhance the flavor of foods, especially dips and creamy salads. Allium cepa is a biennial plant but it is usually grown as an annual. It is part of the Amaryllidaceae family. Modern varieties typically grow to a height of 15 to 45 cm (6 to 18 in) with blueish-green leaves that grow alternately in a flattened, fan-shaped swathe. The leaves fleshy, hollow and cylindrical, with one flattened side. They are at their broadest about a quarter of the way up the stalk beyond which they taper towards a blunt tip. The base of each leaf is a flattened (usually white) sheath that grows out of a basal disc. From the underside of the disc, a bundle of fibrous roots extends for a short way into the soil. 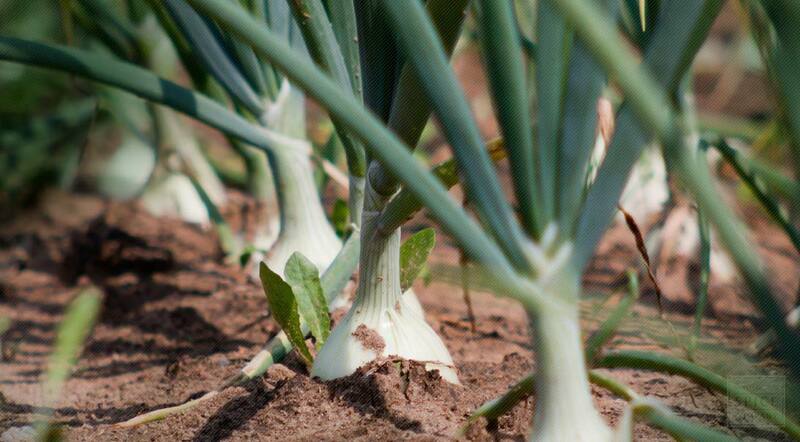 As the onion plant matures, food reserves begin to accumulate in the leaf bases and the bulb of the onion will swell. In the autumn the leaves die back and the outer scales of the bulb become dry and brittle, and this is the time at which the crop is normally harvested. If left in the soil over winter, the growing point in the middle of the bulb begins to develop in the spring. New leaves appear and a long, stout, hollow stem expands, topped by a bract protecting a developing inflorescence. The flower-head takes the form of a globular umbel of white flowers with parts in sixes. The seeds are glossy black and triangular in cross section. Onion is from Anglo-French union; Old French oignon meaning "onion" (formerly also oingnon), and directly from Latin unionem (nominative unio), a colloquial rustic Roman for "a kind of onion”. 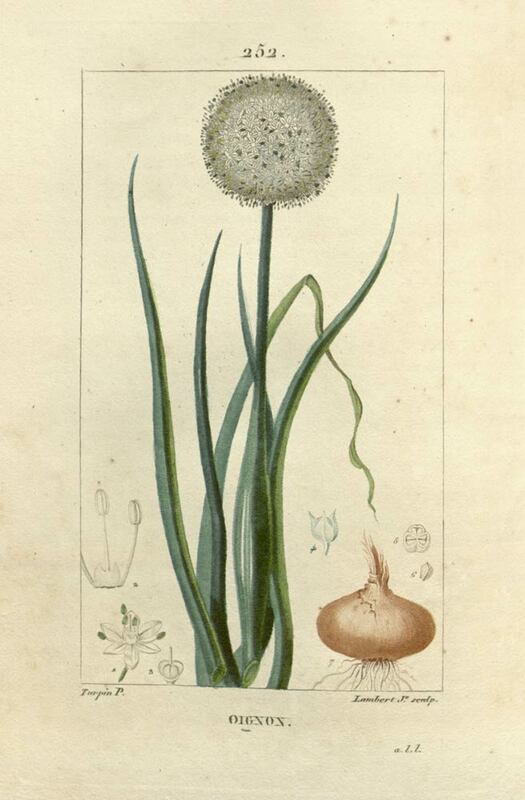 Allium cepa is known exclusively from cultivation, but related wild species occur in Central Asia. Onions are a cool-weather crop and are grown in cultivation. Hot temperatures or other stressful conditions cause them to "bolt", meaning that a flower stem begins to grow. Onions are best cultivated in fertile soils that are well-drained. Sandy loams are good as they are low in sulphur, while clayey soils usually have high sulphur content and produce pungent bulbs. Onions will require a high level of nutrients in the soil. Onions may be grown from seed or from sets. Onion seeds are short lived and fresh seed germinates better. In suitable climates, certain cultivars can be sown in late summer and autumn to overwinter in the ground and produce early crops the following year. Harvest onions in autumn when the leaves have died back, dry for later use as cut pieces or ground powder. Store dried onion in an airtight container in a cool, dry place.